We do mostly purchase air travel itineraries with a short layover (2-3 hours) in the case of connecting flights on long-haul international route, such as USA to India. If our connecting flight happens to be delayed at a transit airport, we feel out of breath. What will it be like if you are offered a complimentary tour of the transit city during a long layover? Amazing! Isn’t it? If you get cheap flight tickets for Turkish Airlines’ itineraries with a minimum 6-hour layover at Istanbul Ataturk Airport, just grab it. Turkish Airlines’ transit passengers will be provided a well-guarded Istanbul City sightseeing tour for free this summer travel season. If you are flying Turkish Airlines from USA to India this summer, and if your itinerary includes a layover of 6 hours or more at Istanbul Ataturk Airport, you should not miss the free tour of Istanbul sightseeing. Why not make your layover at Istanbul a travel diary full of Istanbul history and heritage instead of wasting time waiting for the connecting flight? Turkish Airlines’ flights connect Boston, Houston, Chicago, Atlanta, Miami, Los Angeles, San Francisco, Washington Dulles and New York JFK with India via Istanbul. Turkish Airlines also connects Philadelphia, Dallas Fort/Worth, Cincinnati and other US cities with India through its codeshare partnership with other airlines. Interestingly, passengers of Turkish Airlines’ US to India flights including a minimum 6-hour layover are eligible for the free Touristanbul program. Touristanbul, a free Istanbul City sightseeing tour program for Turkish Airlines’ international passengers in transit, is focused on Istanbul’s historical places, heritage sites, natural tourist attractions and beautiful restaurants. You don’t need an advance reservation to avail the program. Just do report to Istanbul Airport’s Hotel Desk in the international terminal after arrival on a Turkish Airlines flight at the airport. Suitable for family travelers, backpackers and solo trippers, the free Istanbul City sightseeing tour program covers all expenses for meals, transportation, tourist site entry fees and museum tickets. If you check in your luggage for the connecting flight, you can keep the bags at the airport’s baggage storage facility for a nominal fee. Turkish Airlines’ unaccompanied passengers under 18 years of age are not eligible for the free Istanbul City tour, Touristanbul. There is something more exclusive for passengers of Turkish Airlines’ business class flights. It will definitely be a cherry on the cake for Turkish Airlines’ passengers who have got cheap business class flight tickets to India or other destination via Istanbul. Yes, your itinerary must include at least 7-hour wait time at Istanbul Ataturk Airport. As part of the Bosphorus Experience in the city of Istanbul, you can have an exclusive, luxury motorboat ride on the Bosphorus River and drink to breathtaking views of the historical landmarks such as Dolmabahce Palace, the Maiden’s Tower, Galata Tower and Topkapi Palace. Turkish Airlines’ business class travelers in transit can have an unforgettable tryst with the city’s unmatched grandeur and magnificence while dining at any of the waterfront restaurants of Çırağan Palace Kempinski. What to do if your flight to India with Turkish Airlines includes over 20 hours of connection time in Istanbul? The free Stopover service starting this summer travel season (2018) is available for those boarding Turkish Airlines flights, economy or business, to India at any of the nine US gateways (check the third paragraph above). Those flying to South Europe, Eastern Europe, Africa, Russia, Iran and Kazakhstan are also eligible for the free Stopover service in Istanbul. If there is a layover of more than 20 hours in Istanbul on your itinerary, you will be provided complimentary accommodation at a super luxury hotel nearby Istanbul Airport. Passengers of Turkish Airlines’ economy flights to India or any other destination will receive overnight accommodation at a 4-star hotel in Sultanahmet. Those traveling on Turkish Airlines’ business class flights will be treated to luxurious hospitality at a 5-star hotel in Taksim for two nights. 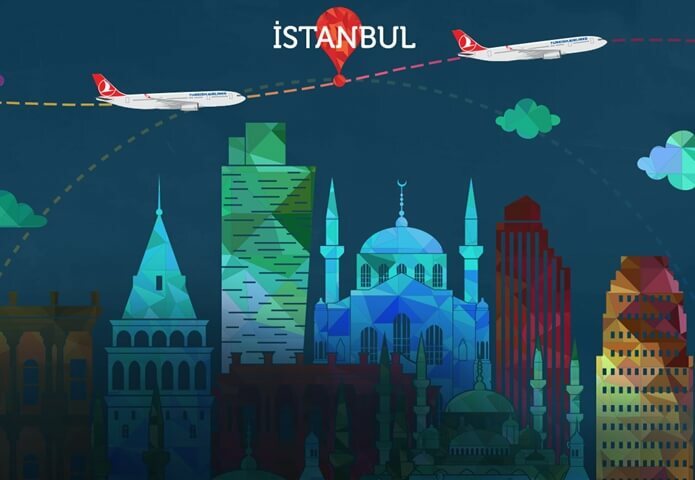 Travelers having confirmed reservation for the itineraries with over 20 hours of connection time will receive free Stopover service vouchers from Turkish Airlines. The free Istanbul City tour and free Stopover service for Turkish Airlines’ international transit passengers are also available for those who book cheap last minute flights to India or other destinations in the airline’s global network. I am travelling with family during May 2019 to England. Can we avail the free Istanbul city tour if we book Turkish Airlines flight? What is the minimun criteria to avail the city tour?